The Flying Huntsman 6x6 might look like bit of a joke, but under that gaudy exterior is a military-grade chassis coated in massive amounts of armor. This is a thing you most definitely want when you venture out into the barren hellscape of a world gone mad. Or Jersey. Remember the Townley Desert Rangers? Have a look, but to cut it short, there was a company in Kent which converted original Range Rovers to six-wheel drive with as much armoring as their customer's lifestyle or political situation required. This is the redux. 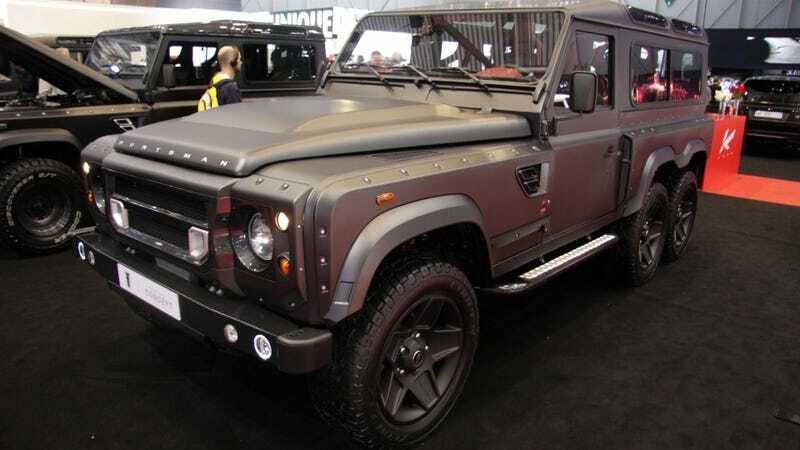 The Huntsman 6x6 might have been designed by Kahn and marketed by London's Chelsea Truck Co., but under the completely custom body panels lies a chassis that was originally engineered in the 80s, but upgraded and retrofitted and now built by the Scottish armored vehicle specialists Penman. Pretty much everything had to be replaced or reenforced to make this work, that's why there's nothing left of the original body panels. And while this concept was put together in just 8 weeks, it's a working prototype that's destined to become something you can buy. In terms of power, your options include a 6.2 LS3, a Ford Coyote with more than 600 hp, or a turbodiesel that's also available prepared for deep water fording. That includes a snorkel, sealed exhausts, doors and wiring, plus a stripped interior with enough rubber to keep keep you afloat. The list of options is almost endless. From a full air suspension to thermochromic paint and an eight gallon onboard clean water system, and any level of ballistic protection you'd need. The truck comes with three buttons on the dash for the locking differentials, and while real 6x6 explorers are likely to ditch the bucket seats, they won't be able to refuse the 9.5-ton electric winch and the Safari package with a full external chassis, an integrated roll cage, rock bars, and a wading system. This, or the 90 next to it with the widebody?